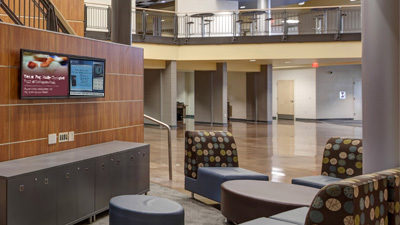 We design digital signage and wayfinding solutions, providing flexible messaging and communications applications for healthcare, education, corporate, government, sports, recreation, convention, entertainment, and other organizations and venues with large, complex or distributed facilities, campuses, and networks. Our digital signage consulting services include systems design that addresses each client’s particular content management and scheduling needs and abilities. We provide not only the appropriate hardware and software specifications, but can facilitate the acquisition and negotiation of managed and content services to provide you with a turnkey solution, on and off premises. From LED and LCD video walls, e-paper walls, and non-traditional display technologies that wow and dazzle, to interactive and immersive touch and gesture, and augmentative and virtual reality experiences that entertain, inform, and provide wayfinding, we design flexible, scalable, cost-efficient systems that can change and grow as your needs evolve. As independent digital signage and wayfinding system consultants, we have no affiliations with any particular brands, products, technologies, or suppliers. We only work for you, bringing objective, unbiased, cost-effective system designs. We specify the appropriate technology and applications for each situation, and manage projects for proper installation, commissioning, and operation.